Authorities released the name Friday of a teenage computer-gaming entrepreneur who plowed a pricey sports car into oncoming rush-hour traffic while speeding the wrong way on Interstate 805 in the Miramar area, causing a fiery nine-vehicle pileup that killed him along with two people in another vehicle. Trevor Heitmann, 18, was driving south in a northbound carpool lane at upwards of 100 mph when his 2015 McLaren 650S smashed head-on into a 2010 Hyundai SUV near Eastgate Mall shortly after 4:30 p.m. Thursday, according to the California Highway Patrol. The impact obliterated the sports car and mangled the larger vehicle, which became engulfed in flames with a 43-year-old woman and 12-year-old girl trapped inside, said CHP public affairs Officer Jake Sanchez. Heitmann, who had made a lucrative name for himself online as a combat-video-game aficionado and promoter, died at the scene of the wreck, as did the occupants of the Hyundai, believed to be mother and daughter. Following the initial collision, several other vehicles also crashed or were struck by debris, including a Honda Pilot whose driver suffered serious injuries, Sanchez said. 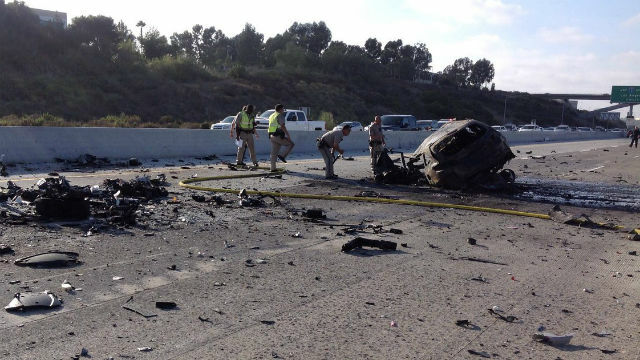 The pileup forced a closure of the entire northbound side of the freeway for about six hours. Exactly how and why Heitmann wound up racing down the interstate against traffic — and whether he did so intentionally or by mistake — remained under investigation Friday afternoon, Sanchez said. Investigators believe he had entered from Carroll Canyon Road, about a half-mile north of the crash scene. The San Diego teenager evidently had also been involved in a strange reckless-driving episode that took place about a half-hour before the deadly freeway collision, Sanchez told reporters. About 4 p.m., a black coupe believed to be Heitmann’s high-performance British sports car smashed through a gate at Ashley Falls Elementary School in Carmel Valley and accelerated onto the grounds of the campus near groups of shocked students, according to the CHP and San Diego police. According to witnesses, the driver stopped briefly, get out of the car and smashed a window on a school building. He then got back into the McLaren and sped away. Why Heitmann, who lived near the school, might have decided to go on a dangerous and destructive joyride at a school was unclear. According to Vpesports.com, a computer-gaming news website, Heitmann, using the online moniker McSkillet, had been a popular and successful YouTube purveyor of videos about the first-person-shooter game Counter-Strike: Global Offensive, and operated a related computer-gambling website, CSGOMagic. Late last year, Valve, the developer of the game, banned all of Heitmann’s accounts related to the franchise due to concerns over its use by bettors. The move resulted in significant monetary losses to the teen, Vpesports.com reported. In the aftermath of the freeway fatalities, numerous Twitter users who claimed to know Heitmann contended he was devastated by the demise of his online business. Many opined he caused the collision intentionally as a means of committing suicide.